US Power Squadron Flag - Nylon - 20x30"
The official US Power Squadron boat flag is 20" x 30" and is constructed of durable, 100% nylon and comes finished with canvas header and brass grommets. 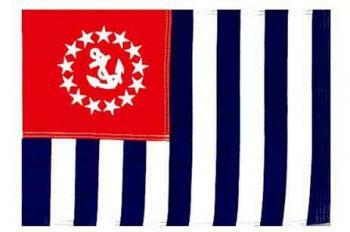 The flag features sewn stripes and embroidered or appliqued stars and anchor. The flag is for the use of US Power Squadron members only.